PRIMORYE TERRITORY, RUSSIA. AUGUST 3, 2015. 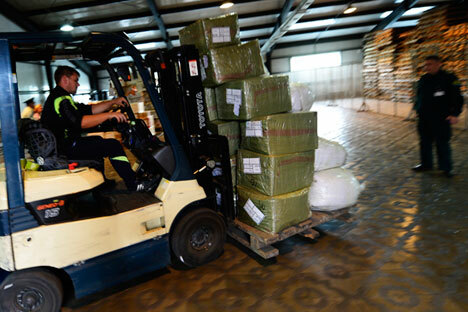 A forklift driver at work at a temporary storage facility at Pogranichny crossing on the Russian-Chinese border. A selection of opinion on international affairs from across the Russian media highlights falling volumes of trade between Russia and China, an analysis of the Turkish Stream gas pipeline and low productivity of Russia’s workforce. Trade volumes between China and Russia decreased considerably, by 28.9 percent, in the first half of 2015. Bilateral trade turnover during this period amounted to $37.72 billion, the Russian centrist daily Nezavisimaya Gazeta reported, citing Xinhua, the Chinese news agency. Chinese exports to Russia fell by 36.1 percent, while import of Russian goods to China decreased by 20.7 percent, the newspaper said, pointing out that these results were not what the Russian government planned. "We will definitely reach a turnover of 100 billion dollars next year," Russian President Vladimir Putin said at a meeting with the Chinese Premier Li Keqiang, in October 2014. These circumstances do not create a particularly optimistic backdrop for talks Putin is scheduled to hold during the “Russia-China: Two Countries – One Way” (BIEF-2015) economic forum, to be held in Beijing in early September, Nezavisimaya Gazeta said. According to Maslov, restoration of previous levels of trade linkages is not possible because of the decline in Russians' purchasing power, combined with the relative reduction in China’s demand for oil and gas. However, the Chinese may be interested in the Territories of Priority Development (TPD) proposed by Moscow in the region of Khabarovsk and Vladivostok in the Far East, he said. Economist Ruslan Grinberg, who heads the organizing committee of the forthcoming BIEF-2015 forum, told Nezavisimaya Gazeta that he was optimistic about the new joint Russian-Chinese infrastructure projects in Russia, and the recruitment of Chinese in the transport and housing construction sectors in Russia. The Russian gas giant Gazprom estimates that laying the four pipelines of the Turkish Stream will cost €11.4 billion, the website Gazeta.ru reported, as it sought expert opinion on the future of the project, which aims to supply Russian gas to a distribution hub in Turkey via the Black Sea. Industry experts have repeatedly expressed the opinion that even if the Turkish Stream project is implemented, it will be limited to a single pipeline. According to the experts interviewed by Gazeta.ru, this is due to the ongoing delay in Russian-Turkish negotiations, as well as the fact that the Turkish Stream project is opposed by Europe and the U.S.
RusEnergy partner Mikhail Krutikhin specified that the sum published by the company only includes the cost of the marine part of the pipeline. However, according to experts, even these figures are subject to serious doubt. “Upon completing construction, Gazprom has never complied with the planned expenditure on gas pipelines,” said Krutikhin, who suggests that Turkish Stream will be implemented only partially. Mikhail Korchemkin, head of East European Gas Analysis, agrees with this opinion. “If Gazprom will be able to build Turkish Stream, the gas pipeline will have no more than one line,” he told Gazeta.ru. Labor productivity in Russia in terms of hours of work is almost half that of Greece, and almost 2.5 times less than in Germany, the business daily Kommersant reports, citing data from the Organization for Economic Cooperation and Development (OECD). Russia is lagging behind in terms of wages as well, writes Kommersant. The average wage in Russia among developed (according to the OECD) countries is comparable only with Mexico. At the same time, the OECD points out, Russia is one of the leaders in the number of hours worked, the newspaper reports. “The fact that Russia's labor productivity is three or four times lower than the average European – and even more so in some branches – is due to the poor standard of technical equipment atworkplaces and professional training, as well as the practically non-existent stimulatory function of salaries in the real sector,” Andrei Korovkin, from the Institute of Economic Forecasting at the Russian Academy of Sciences, told Kommersant.